A few weeks back, I was standing in line at the opening party for Metropolitan Home’s Modern by Design showcase at Baker Street, wondering what the latest from San Francisco’s top interior design luminaries would be. This project, a high-profile rehab of a 7,700 SF home, involved invitations to 14 design studios and giving them the freedom to create the interiors as they pleased – on their own dime. Imagine my surprise at the top to discover Min/Day Architecture’s playful and colorful three-room “Jack and Jill” attic suite with handily elegant Murphy bed tucked away behind a custom-perforated sliding panel, a jewel-like green-tiled bathroom, and an adjoining room featuring large pink dots, with a modular table that looked like something Andy Goldsworthy might do if he ever tried working with stacked birch plywood as a fabrication medium. Imagine my surprise at the top to discover Min/Day Architecture‘s playful and colorful three-room “Jack and Jill” attic suite with handily elegant Murphy bed tucked away behind a custom-perforated sliding panel, a jewel-like green-tiled bathroom, and an adjoining room featuring large pink dots, with a modular table that looked like something Andy Goldsworthy might do if he ever tried working with stacked birch plywood as a fabrication medium. The overall theme looked like a mathematical distribution of dot patterns repeated in various ways – how did they do that? I wondered, my eyes watering a little as I squinted at the madly dancing dots. What algorithm did they use? The components were too regular to be hand painted, but too lyrical to have been generated by a mindless machine. Oftentimes, industrial-design vectors and geometries are easy to spot – but these dots defied easy definition, and seemed to indicate an intellectual and creative process that was very different from the sensibilities in the rest of the house. I was so curious I went and asked them. 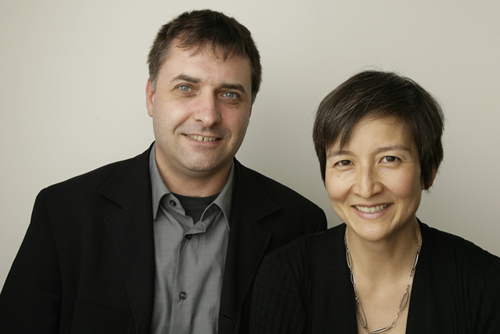 EB Min and Jeffrey Day have a practice with offices in San Francisco and Omaha, and they’re both well-versed in advanced fabrication design techniques. How did they make their clean-edged, precisely fabricated components so… organic? And how did they ever dream up this idea in the first place? Then Min/Day hit upon the idea of “interior landscape” – something they’d done extensively in past projects. 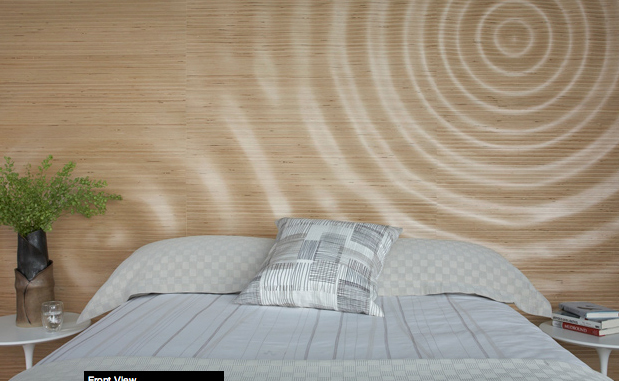 A lakeside home in Iowa, for example, featured a “Raindrop Wall” – a waveform interference pattern on the stacked-plywood head board that echoed the lake surface 10 feet away. 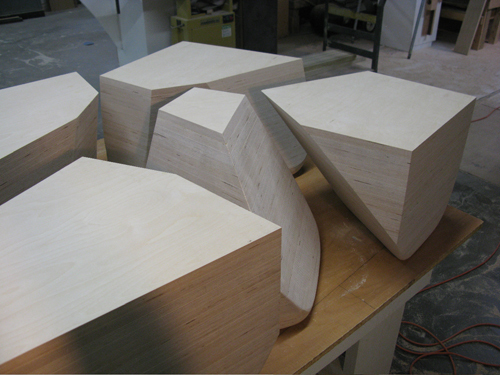 Min/Day designed custom furniture in Rhino, and also designed all the landscaping. And nothing says “San Francisco” more than fog. Fog… clouds… daydreaming… and thus the Cloud Wall, the Stones Table, and the Fog Wall were born. Software tools included Rhino, Grasshopper, Illustrator, and Vectoraster. 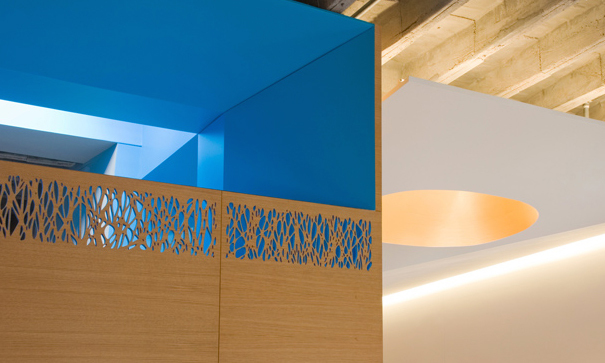 The Cloud Wall was created from a photo using Vectoraster, a graphics utility that generates scalable vector-based halftone dot screens with customizable grids. Did you pick discrete dot sizes? I asked, betting with myself under the table. Yes, they had, probably a posterize filter in Photoshop. Keeping the sizes simple actually reinforced the optical illusion, especially from very close up. 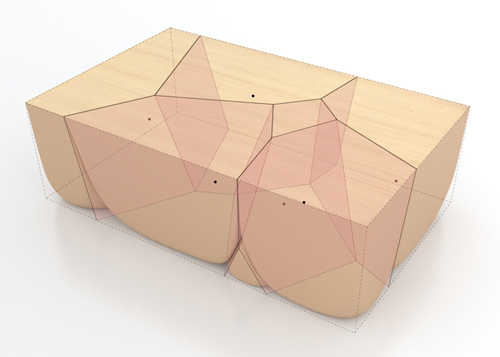 They created the table shape as a Golden Rectangle with standard proportions.The first challenge was dividing the volume into six random but pleasing shapes that would be stable enough to stand alone. 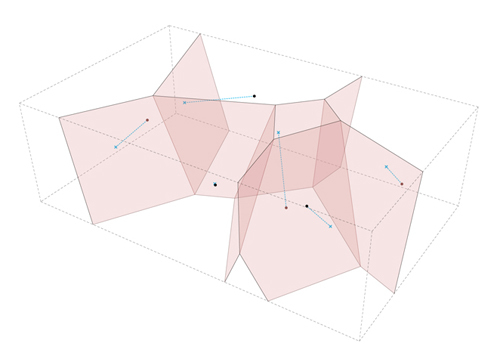 Instead of just manually slicing up the volume, Min/Day decided that it would be more elegant and natural to let mathematical law determine the shapes using a geometric concept called a Voronoi diagram. A Voronoi diagram is essentially a type of surface tiling, created by defining a discrete set of points or “sites” on a surface plane, and then defining “cells” which consist of all the area around each point that is closer to that point than to any other point. 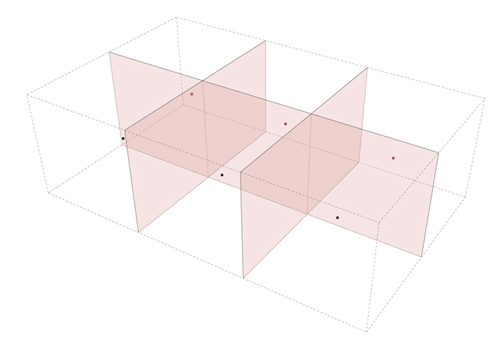 The boundaries between the cells are where it is equidistant between two sites, and the corner nodes are points equidistant to three (or more) sites. 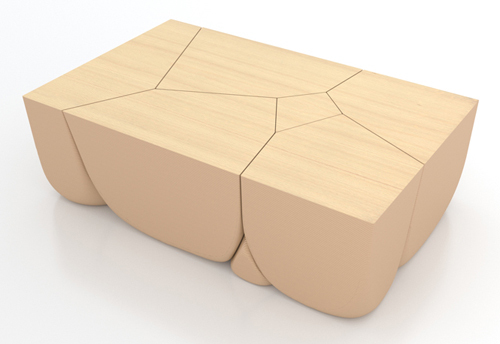 The table of course is three-dimensional, not two – making the problem-solving exercise that much more complex. 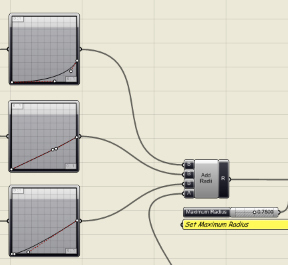 Scripting all the transformations in Grasshopper allowed for a very iterative design approach. “Most architects think about form. 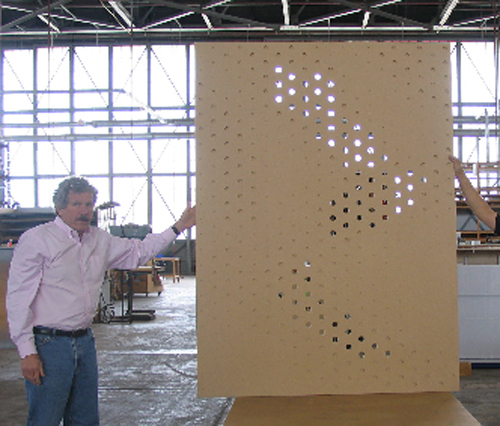 This method emphasizes logic, and the forms are the result of that logic.” They could experiment with just about anything in the model, from the hole sizes to the axis of extrusion. There’s something very elegant and abstract about Min/Day’s designs, and yet despite their formal qualities, they are very much based on what I would call natural law. They’re not sterile ideals of intellectual perfection – they look like natural forces such as gravity and wind have been at work. In fact, Min/Day’s use of computational geometry parallels the discovery of the original laws and formulae within nature, and is a use of digital technology to highlight nature rather than leapfrog it. The five-dollar word for “tiling” is “tessellation”. 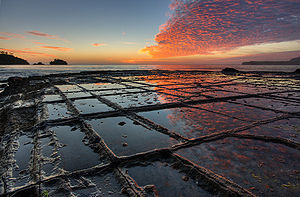 Tessellations frequently appeared in the art of M. C. Escher, and they also appear in natural sites such as this Tasmanian beach. We talked about the ins and outs of relying on tightly controlled custom fabrication. Fabrication can be easier, but information management can be a challenge. Having more control over the logic enables Min/Day to work very closely with their fabricators and to control timelines far better than with outsourced custom furniture, which has a typical lead time of 12 to 16 weeks. Although Min/Day donated their labor and material costs, they do get to keep the items afterwards. “The Fog Wall assembly was designed for portability”. Metropolitan Home funded the permanent finishes and fixtures. The whole project was done in four and a half months. first of all congrats for your works, very interesting. 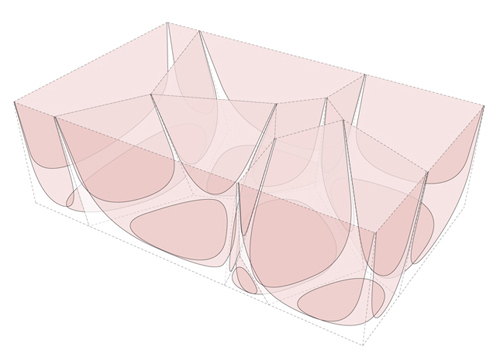 I use grasshopper too, and i m kind of curious to know how you created 3D voronoi volumes in your Stones Table.